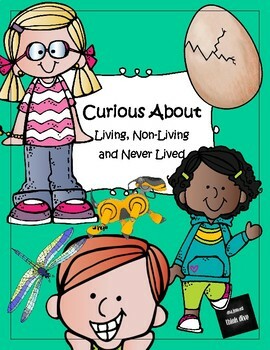 Learning how to classify things into living, non-living and never lived is part of primary science. Most educational material is rather straightforward. Children are told that trees are living things. Bees and people are also living things. Apples in the fruitbowls are dead, but they were once just like the leaves on the ground part of a living tree. Anything plastic, metal or stone has never been alive. Wood that has been separated from a tree is dead because it has been removed from the source of nurients. But wood on the tree is alive. A chair made of wood is non-living. This booklet also challenge the students' thinking. What if we build a growing chair? What if we build a growing robot? What if not all living things need water? Water has been regarded as essential for life, but it seems like we should not assume that all living things need water. This is important when we serach for life on other planets. Three posters Living, Non-Living Never Lived - color as well as black and white versions. 4. 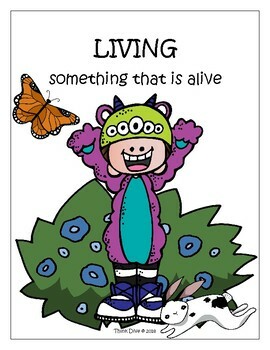 Living! - How do you know? 6. 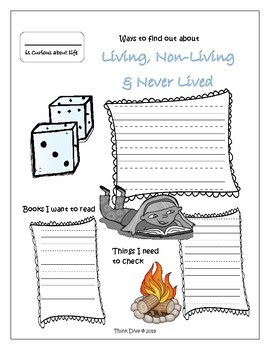 Never Lived! How do you know? 7. Ask the snow hare questions about what living things need. 8. Ask the leopard seal questions about non-living things. 19. Think Dive Discuss and ponder over the questions.